Saturn’s largest moon, Titan, is a giant nightmare beach. While its electrically charged sand wouldn’t make for a relaxing vacation, new research suggests the planet might not be as hostile to robotic visitors as we think. Although its lakes are full of ultra-cold liquid methane and ethane, they could be placid enough for future space probe to land on. Still not great for swimming, though. In a new study, published on June 29th in Earth and Planetary Science Letters, researchers used radar data from NASA’s Cassini spacecraft to measure the roughness of three lakes located in near Saturnian moon’s north pole—Kraken Mare, Ligeia Mare and Punga Mare. Ligeia Mare, the second biggest of the bunch, is larger than Lake Superior and could hold more than 50 times Earth’s oil reserves, according to Science News. 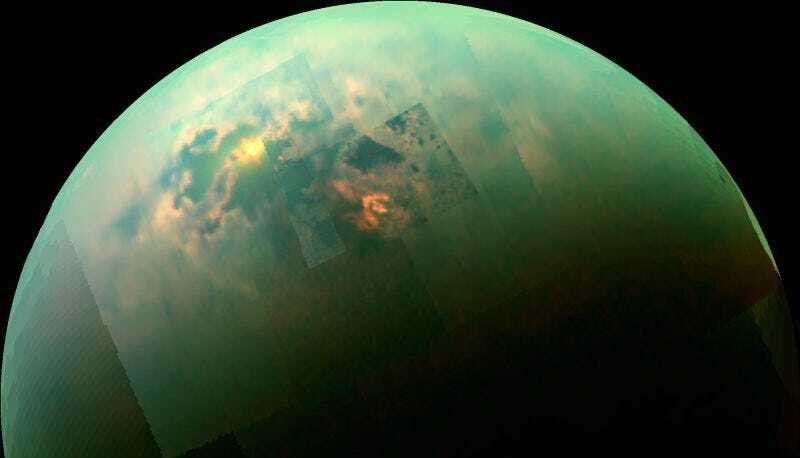 By using a technique called radar statistical reconnaissance, the team was able to ascertain the size of Titan’s puny waves—apparently, at the time of measurement they only reached about 1 centimeter high and 20 centimeters long. Radar data has been used to study Titan’s waves before, and has yielded interesting results: in a study conducted in 2014, researchers asserted that a “Magic Island”on Ligeia Mare—which keeps appearing and disappearing—is actually just the result of wave action in the hydrocarbon sea. The new measurements suggest Titan’s waves aren’t great for surfing. But then again, neither is methane. The data analyzed in this particular study was all collected by Cassini during the early summer season, and it’s unclear how much the waves fluctuate over time. That said, the research is useful for future missions to the Saturnian system once Cassini’s gone. Whenever NASA (or other space agencies) decide to land on Titan, the new research suggests they may have smooth sailing. Concept missions specifically designed for the Titan seas are already bubbling up, like the Titan Mare Explorer (TiME). Though NASA ultimately passed on the project, a mockup of the lander was successfully tested in a Chilean mountain lake. The TiME team’s research could lay the groundwork for further missions. Hopefully, Titan landers will steer clear of swimming, or at least get some cool X-Men powers out of it.